The AFL ASCEND is a modular high-density platform designed for larger and more technical data centre environments. The platform consists of fibre housings, cassettes and assemblies. The fibre housings offer flexibility, functionality and ease of use. Available in 1, 2 and 4RU sizes with densities of up to 144, 288 and 576 fibres, these fibre housings consist of front and back doors both hinged on the bottom. The back of the housing cover is removable for unobstructed access to all connector interfaces. With routing rings at the front of the trays, routing patch cords is easy, secured and organised. Another key feature of the platform is the versatile cassette design. Providing a wide range of options, the cassette portfolio is one of the most comprehensive in the industry. The cassettes independently mount within the fibre management housings and trays allowing for ease of access and modularity. Cassette designs range from BASE-8 to BASE-24 and cover additional applications ranging from patch-thru connectivity to xWDM installation. 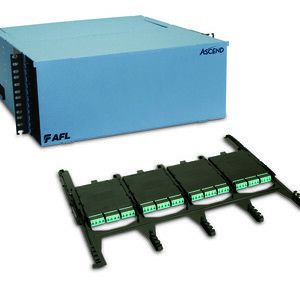 Available in singlemode and multimode, the optical cassettes feature low loss MPO connectors and VFL compatible shuttered LC adapters. Splice cassettes include 250 µm pre-terminated single fibre pigtails and can be spliced directly to loose or ribbon fibre cable. Splice cassettes are compatible with all BASE-12 housings. 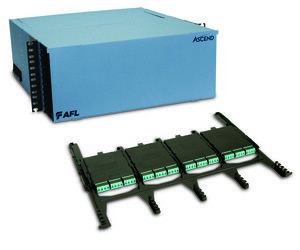 Available in singlemode and multimode, fan out cassettes are pre-terminated plug-and-play breakout modules designed to transition a trunk cable into individual connector ports. The platform also includes both trunk cable and patch cord assemblies. Trunk cable assemblies feature Microcore cable and the MTP PRO connector which allows for field reversible polarity and gender with no housing removal, exposed fibres or loose points. Available in 12 to 144 fibres in BASE-8 and BASE-12 configurations, trunk cable assemblies include an integrated cable mounting clip, which eliminates the need for additional cable clamps, securely positioning the incoming cable and eliminating stress during installation. Patch cord assemblies are constructed with Dual-Link cable and terminated with a field-reversible LC Uniboot connector, minimising the front-side cabling footprint and reducing the impact on airflow up and down the rack and between the racks.